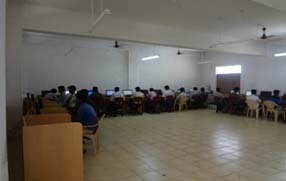 The department of Electrical and Electronics Engineering started in the year 2010-2011. The Department has been established with the firm commitment of developing and producing quality Electrical and Electronic Engineers with high-technical knowledge and good practical basis, combined with leadership skills and decision making capability. The department boasts of distinguished and dedicated faculty that offers full support to the students to help bring out the best in them. Students’ are given a free choice to select the electives from a variety of courses being offered by the department in conjunction with the other allied branches of study. The Department library houses large volumes of various tiles which serve both the faculty and students. 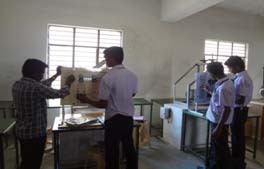 The Laboratories are fully equipped with sophisticated equipments and machines as per the norms of Directorate of Technical Education. The department boasts of distinguished and dedicated faculty that offers full support to the students to help bring out the best in them. Students’ are given a free choice to select the electives from a variety of courses being offered by the department in conjunction with the other allied branches of study. The significance of Electrical Machines is renowned in various fields of Engineering for an Electrical Engineer, it is obligatory to have the practical idea about the Electrical machines. The purpose of lab is to make the students to gain the knowledge experimentally by doing different Experiments on Different topics. The main objective of Power Electronics lab is to prepare the students for the careers in power industry. This lab introduces the student to measurement and simulation of important operating characteristics of Power Electronic Circuits and Power semiconductor devices. This provides the basic knowledge in Power Electronic converters and operating characteristics of SCR, MOSFET and IGBT. The laboratory enables the students to gain practical experience in connecting circuits with discrete components and testing the circuits. This lab course is intended to know the usage of electronic equipment. Know the testing of components. Understand the PN diode operation in forward and reverse bias. Know how to connect transistor in CB, CE configurations. It is fully equipped with the microprocessor trainer kits and 8051 microcontroller development boards. The work on microprocessors utilizes the 8085 microprocessor trainer kits and also the lab has the facility to do work on microprocessor with two approaches by TASM and MASM. The Microprocessor and Microcontroller lab is enhanced to meet the industrial needs and to support research. The purpose of lab is to make the students to gain the knowledge experimentally by doing different experiments on different topics and verifying them with theoretically. Electrical circuits lab is mainly classified by the different theorems by which the response in any circuit is to be determined. 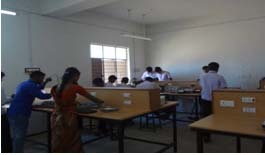 The significance of the electrical circuits and simulation lab is renowned in various fields of engineering application. The significance control of Electrical Machines is renowned in various fields of Engineering for an Electrical Engineer, it is obligatory to have the practical idea about the Electrical machines. The purpose of lab is to make the students to gain the knowledge experimentally by doing different Experiments on Different topics. The purpose of lab is to make the students to gain the knowledge experimentally by doing different experiments on different topics and verifying them with theoretically. Electrical circuit’s lab is mainly classified by the different theorems by which the response in any circuit is to be determined. 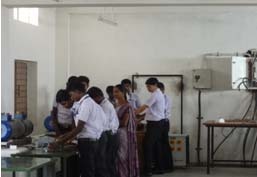 The significance of the CAED lab is renowned in various fields of engineering application.